Join now and get a 100% First Time Bonus! Visit DraftKings and start betting! Draft Kings is 128 Bit Certified Authentic, PayPal secure, and is 100% legal in the U.S.
Fast and reliable withdrawal within 2-7 days. ? 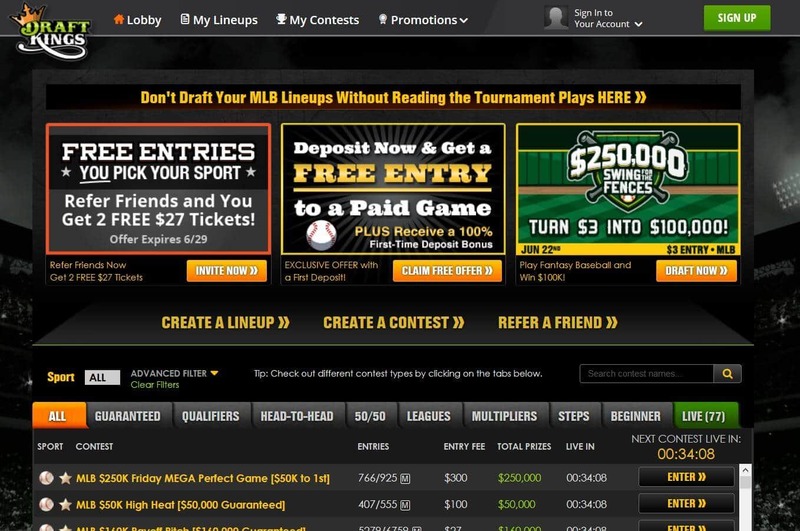 All legitimate, real-money Fantasy Sports sites like DraftKings.com have strict anti-fraud screens, and that may create a short withdrawal delay. Accepts Visa, MasterCard, Discover, American Express, and PayPal. Also accepts gift cards from Visa, MasterCard, and American Express. Receive a 100% first-time deposit bonus. Earn $1 for every 100 Free Player Points you earn in paid contests. Earn 35% on every referral to the site. Play and win cash tomorrow. DraftKings.com is one of the largest fantasy sports sites on the market and it is considered to be one of the first stops online for any keen fantasy sports enthusiast that wants to get involved at a new site. The first thing that stands out when you sign up to DraftKings.com is the sheer scale of the contests on offer. Every major US sport is covered with a range of fantasy sports contests covering the NFL, NBA, NHL, MLB, CFB, CBB, PGA, SOC, and MMA. This is an era now where the list of potential fantasy sports contests you can enter displays in a similar way to the number of poker tables you can join when you sign up to an online poker site. The number of contests on offer refreshes on a daily basis with contests based on the sports schedules of that specific day. Just to give you a taster, on one day you can play fantasy football sports contests based on the NFL schedule and then the next day you can play fantasy national hockey league sports contests based on the NHL schedule. The variety of contests available to play is also mesmerizing. The contest search tab lists potential contests in the form of Guaranteed (where the prize pool is guaranteed a minimum amount), Qualifiers (where winners progress to another contest), Head-to-Head (play against one other participant's team with the winner taking all), 50-50 (where participants that finish in the top 50% share the prize pool), Leagues (where participants battle it out in a league format), Multipliers (where participants need to finish in a selection of certain positions to win), Steps (where participants proceed to the next contest, or step, if they win the contest they enter), and Beginner (where the beginners play). Every angle is covered. The beauty of modern day fantasy sports is that there is no season-long commitment required. Gone are the days when you would need to pick your team in pre-season and then be forced to stick with that team and follow their fortunes across a whole season before finally finding out how successful you had been. The combination of waiting so long to find out the winners and being unable to change your side to any great degree throughout the season saw a huge demand from participants for fantasy sports games to become shorter and more clinical. DraftKings.com is one of those fantasy sports sites that offers players the chance to not only play one fantasy sports contest every day but potentially enter numerous fantasy sports contests every day. NFL fantasy football will now no longer force participants to wait an entire season to discover their fortunes. Instead, participants will pick their team on the Monday and know the outcome on Tuesday. The one advantage of this daily schedule is that you do not have to settle for the same players for the whole season. Every day, for every new fantasy sports contest you enter, you get to pick a different team. You will no longer have to suffer the poor performance of the usual suspect you picked months earlier as might have happened in your real time fantasy sports league. If your basketball selections do not work on the Monday then you get to scratch it all and go again on the Tuesday. At DraftKings.com, you have a salary cap of $50,000 no matter what sport you pick. If you opt to play a contest based on major league baseball then you will have to pick a side that fulfils the required criteria of that salary cap. The budget of the participant is also a big benefit of playing daily fantasy sports leagues. There is a wide range of entry fees at DraftKings.com so if you want to play for $1 then you can. If you are more of a high roller and want to play for $5,300 then you can. No real money budget is outlawed at DraftKings.com. So whether you want to play the NBA $5,300 Head-to-Head contest that can win you $10,000 or you fancy the smaller entry fee of the MMA $2 10- Player Winner Takes All where you could win $18, it's your call. 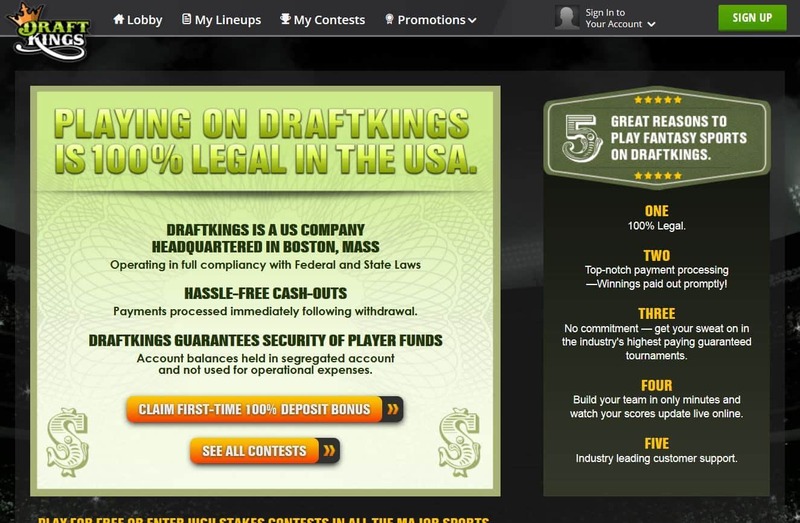 DraftKings.com is also a site that has not been left behind in the 20th century. Participants can play for real cash whilst on the move. Participants can download the app onto iPad, iPhone, and Android mobile devices so that the game can be enjoyed on a laptop or a cell phone in equal measure. This will be good news to players that love their smartphone apps and rely on fantasy sports contests to get them through the journey to and from work. Interestingly, DraftKings.com experienced an acrimonious rivalry with rival fantasy sports site FanDuel.com. FanDuel does exactly what it says on the tin where it offers a fan duel process to its fantasy sports contests. The two sites went head-to-head in the media when DraftKings.com was accused by FanDuel.com of false advertising. DraftKings.com obviously refuted the claims but it was a bitter dispute that did neither site any good in the PR department. It even led to some speculation that the FanDuel strategy in the market was more underhand than that of DraftKings.com. FanDuel has won positive feedback for the FanDuel promo and bonuses but the FanDuel fantasy football offering is still considering to be playing second fiddle to the DraftKings.com offering that thrives on its NFL contests. However, that is a topic for our FanDuel review! DraftKings.com fits into the contemporary attitude of having things your own way. You can pick the sports contest, the entry fee, and the players. It gives complete control and offers enough options so that you will not be stuck short of ideas of which fantasy sports contest to join. They say that New York is the city that never sleeps. DraftKings.com is the fantasy sports site that never sleeps and that is what makes it one of the best fantasy sports sites around. Fantasy sports are where players take on the role of the manager or owner of a team and must build a team to compete against other players. Players must build their own team based on a given budget and rules. They then compete against fellow players who have also built their own teams. Player points within the teams are then based on real-life statistics and performance. Fantasy sports operate in full compliance with the 2006 Unlawful Internet Gambling Enforcement Act and is completely legal. Players can sign up through the sign up process available on the homepage of the chosen fantasy sports website. It really depends what you are looking for from your fantasy sports game. You want a site that covers the sport you intend to play but also caters for your budget and time scale. DraftKings.com offers games from the MLB, NBA, NFL, and NHL along with other sports so it does accommodate a large player audience. Both free play and real money games are available to play so a deposit is not compulsory. You will only need to bet the entry amount. This will depend on the game you enter. Some games on DraftKings.com are available to enter for free but others can require a cash deposit in excess of $1,000. DraftKings.com offers players the chance to win large sums of money, particularly in the Guaranteed prize pool games, from a small entry bet. Even entry bets as small as $1 can see players hit a $1,500 first prize. The fantasy sports games at DraftKings rely on real-life events and real-life performances. There is no method of manipulating the points system. You are given a $50,000 salary cap to your team. There are also specific rules in place for picking a team depending on the sport you decide to play. For example, if you choose to play an NFL game you will be required to pick one quarter back, two running backs, three wide receivers, one tight end, one defence/special teams, and one flexible player that can play in any position. You would then have a different set up for NHL, NBA, and MLB games. On the homepage there is a list of contests that are scheduled to begin and in-play. The list allows you to scan over the game type, game name, sport, entry bet, prize pool, number of entrants, and when the game goes live. You can pick your contest based on that information. Fantasy sports is deemed to be a game of skill and different strategies have been developed in order to increase the chances of success. However, there is no single strategy that is believed to be linked to a winning formula. You can increase your chances of winning by studying the form and statistics of the players you are considering picking. There is an option to create a contest on the homepage. This will give you the chance to create your own game and invite your friends to play in a private game format. Knowledge is power. The sport you are most familiar with is the sport that is most likely to produce wins for you. The more you know the players in the sport, the more educated a decision you can make when drafting your team. NFL is the generally considered to be the most popular at DraftKings.com. However, it depends on what time of the year you play and what stage of the season each sport is at. DraftKings.com offers a range of fantasy sports games that do not require an entry fee and can be played for free. There are countless numbers of leagues available to play. These leagues are first separated by sport and then divided into different entry bet levels. If you draft the same team as somebody else and you end up finishing on the same points then the prize winnings for the two positions you finish in will be split between the two of you. Winnings will automatically be accredited to your account and there is a withdrawal option on the My Account page at DraftKings.com. Your winnings will be added to your account as soon as the sporting event your fantasy sports game is based on finishes and the results have been collated. Yes, fantasy sports operate within the sporting seasons. Fantasy sports games can be played on a daily basis or a weekly basis at DraftKings.com so you do not have to wait long before finding out if you have won or not. There is no secret to winning in fantasy sports. Becoming more familiar and analysing the player stats can help you to draft the players that will give you the best chance of winning. A mobile app of DraftKings.com is available to download on the iPhone, iPad, and Android devices. Knowing players well is not a pre-requisite to play fantasy sports but understanding their strengths and weaknesses will help you to draft the players that can give you the best chance of winning. DraftKings.com offers a number of promotional bonus offers including a refer a friend bonus where you get free entry into the NFL $700k Divisional Clash, and a deposit bonus where DraftKings.com will double your cash deposit up to the value of $600. DraftKings.com accepts credit card, PayPal, and Dwolla as deposit methods. Visa, Mastercard and American Express giftcards are also accepted. All deposit methods at DraftKings.com are considered to be equally safe. Credit card and PayPal deposit methods require up to three business days to process. The downside to the Dwolla payment method is that one party is responsible for paying a transaction fee. Dwolla and PayPal are methods of payment at DraftKings.com and do not require the participant to use a credit card. Games:Daily and weekly fantasy sports contests in MLB, NHL, NFL, NBA, PGA, and college football and basketball. Join DraftKings.com today and double your deposit!